Videcom's extensive experience with Departure Control Systems has lead to the development of this new generation check-in module which is fully integrated with the core reservation systems providing real time data at the airport. With a full graphical user interface the system provides a very easy to use and rapid tool for airport staff to check in passengers and their baggage producing boarding passes and bag tags in any format. 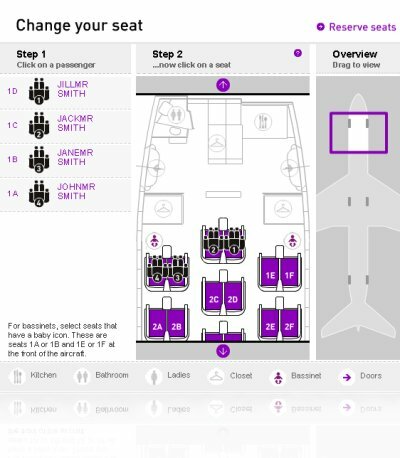 A graphical seat map shows the check-in agents which seats are available and allows them to select multiple seats for groups. The integrated DCS Check-in system allows airline staff access in real time to all flights scheduled for your airline. An unlimited number of check-in agents can access and perform check-in operations on the same flight at the same time and can access any other flight from the same screen. As well as checking-in your own airline flights you can receive PNL's and ADL's from other airline systems and complete full check-in proceedures as a handling company. IATA PNL's can be imported automatically to the system via TTY messages and all the functions of the check-in system can be used for the other airline. Communications from all locations across the world are simple using a standard internet connection and can be used on any PC based workstation or laptop. You can also run the check-in system with a wireless connection using a laptop with a WiFi connection or 3G connection which is rapid due to very low data transmission from the system. Users then have full direct access to all centralized data in the core system which allows real time connections to the latest passenger data. Check-in staff can access the full booking and even change bookings at the check-in desk if required and authorized. When the check-in agent requests a flight within the DCS a full list of ticketed passengers is displayed and is color coded so that the agent can see the status of the passengers - Ticketed, checked-in or boarded. The agent can then carry out check-in operations directly from the screen including seat allocation, checking the passenger in, printing boarding passes and bag tags and entering the Advanced Passenger Information. Interactive seat plans are displayed to the check-in agent which allows them to allocate seats, block seats and view which seats are occupied, checked-in and boarded. All the seat plans including those in DCS and online work in real time and from the same data to eliminate the possibility of seat duplications. The system prints IATA compliant boarding passes and bag tags automatically when passengers are checked-in.